A light and cheerful children’s song to make your Monday happy. As it hurried down the hill. As it fell upon the flow’rs. Oh, TAKE the heart I cannot give! And MAKE me to Thy glory live. 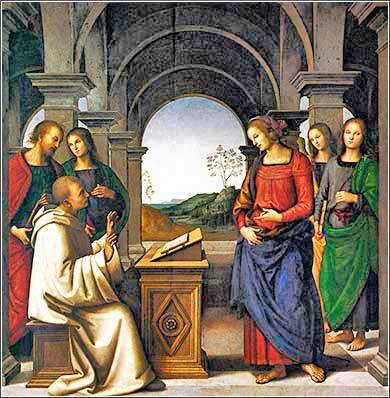 The Vision of Saint Bernard by Pietro Perugino, ca. 1493. Bernard of Clairvaux was known for his charity and founded the Benedictine Order.
. . . continued from Saturday. Thus, when Jesus tells us to love our enemies, he is not implying that we should feel towards them the type of affection we feel towards our spouse, or our family, or our friends. Instead, it is a general feeling of benevolence that we use to disarm our natural anger and hatred. Imagine two siblings who fight all the time, who are very different and just don't get along. Each of them wants their parents to love them and hate their brother or sister, to side with them in their never ending disputes. But the parents love both of their children, absolutely and unconditionally. People with an immature concept of God are like these children; they pray to God for victory over their enemies. The belt buckles of German soldiers in WW1 were inscribed Gott mit uns, “God with us.” We want the benefits of the Hebrews in the Old Testament, although we (like, so often, the Hebrews themselves) have no thought of complying with God's laws. But Christ now asks us to take the view, not of ourselves as the squabbling child, but of the parent. We are to stand above our personal, selfish emotions and see other people as God sees them: his beautiful children whom he loves, even when they misbehave. The love here is one of personal relationships. The ease with which we might declare that war is bad, or that somebody should be taking care of the poor, signal their irrelevance to the duty Christ has taught us. 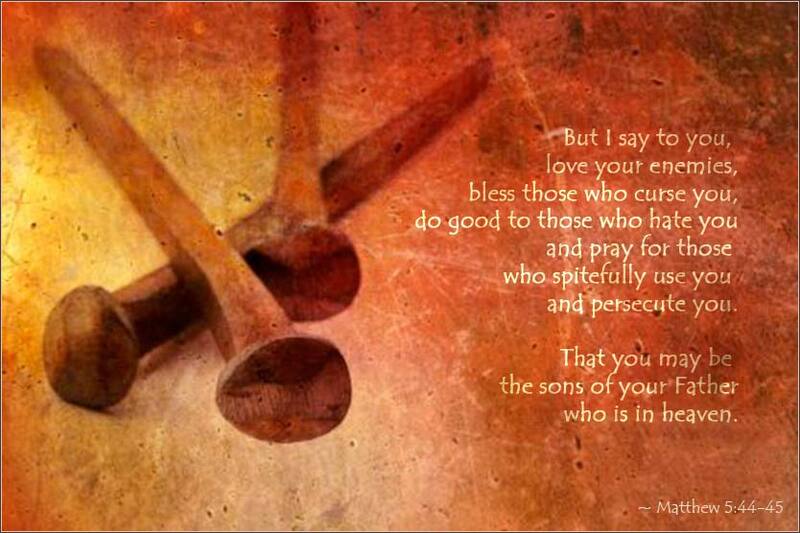 Christ instructs us to look to our own conduct. A nasty diatribe in a speech or publication, a sermon about how the government should be acting, an angry placard carried in a noisy demonstration: these activities not only fail to obey Christ's message of loving our enemy, but contravene his previous lesson about refusing to resist evil people. It may be the hardest lesson in Christianity, but Matthew 5:38-47 can only be read one way. The passage is counter-intuitive; it is precisely the opposite of our natural inclination when we love good and despise evil; we want to force society to be good. Yet, there it is. Our duty to Christ is to rule our own conduct, not that of others. That said, we certainly have a duty to speak the truth fearlessly, and to disseminate the message of love and charity that Christ teaches. But we must always keep at the forefront our motivation to love the wrongdoer; for a self-righteous and angry Christian message is worse than silence.